Shares in Sainsbury's have risen by as much as 18% after private equity investors said they were considering a takeover bid for the supermarket chain. CVC, Kohlberg Kravis Roberts and Blackstone said they were in the preliminary stages of assessing a possible bid for the UK firm. The speculation pushed Sainsbury's shares as high as 526.5 pence, valuing the firm at about £9bn ($17.6bn). Sainsbury's is Britain's third-biggest grocery chain, after Tesco and Asda. Sainsbury's shares closed up 61.75 pence at 507 pence - almost 13.8% up on the day. The company is close to completing a three-year turnaround plan that has gone a long way towards reviving its fortunes. 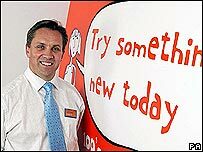 Under chief executive Justin King, Sainsbury's has cut jobs, closed underperforming stores and improved the supply and distribution chain. The share price has been rising consistently while Mr King has been in charge. Sainsbury's has for some time been viewed as a potential takeover target for private equity firms. However, in a joint statement, CVC, Kohlberg Kravis Roberts and Blackstone said "no decision" had yet been made on the relative merits of an offer. "There can be no assurance that any offer for Sainsbury will be forthcoming," the US-based private equity consortium said. The three companies are some of the biggest private equity firms in the world. Sainsbury's said it had not received a bid proposal from the private equity group. "No proposal has been received. Accordingly Sainsbury's has no further comment to make," the company added. BBC business editor Robert Peston says Sainsbury's is attractive as a bid target because of the value of its stores as physical assets, rather than as trading shops. The broking firm, Numis, recently estimated that Sainsbury's freeholds are worth about £7.5bn, which compares with the current market value of the business as a whole of £8.8bn. 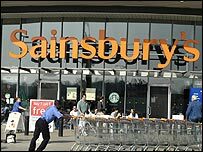 Takeover rumours were given added impetus on Thursday when the company said that the Sainsbury family trust had reduced its share holding to 13.9%. The Sainsbury family's stake in the company has been seen as a potential obstacle to any possible takeover. The bid talks also lifted shares in other UK supermarket groups. Morrisons shares gained 7% while Marks and Spencer and Tesco rose 4.1% and 3.6% respectively.